We’ve just been having our dining room redecorated and recarpeted to make it into a better study/office and not a dining room. This means I have had to carry all the contents of our bookshelf upstairs (two weeks ago) and back down again (today). Now bearing in mind, this household has two OU MBAs – gained through slightly different elective routes – plus my MSc STiP. 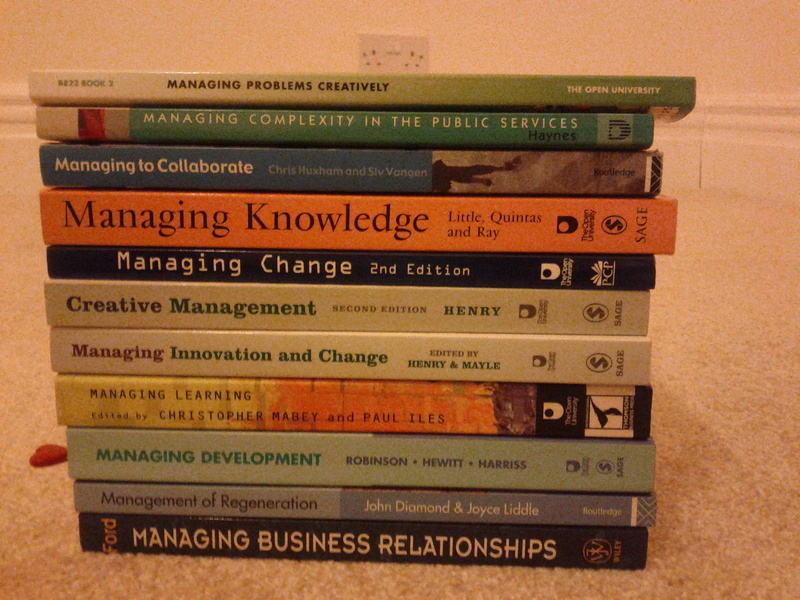 I started to realise just how many books we have with ‘managing’ or ‘management’ in the title. Interesting that some are about managing a ‘thing’ – like knowledge or relationships – others are about managing a ‘process’ – change; learning; innovation; development. isn’t that about managing systemically for systemic change? <a href="http://helen.wilding.name/wp-content/uploads/2013/02/IMG_20130215_184157.jpg"><img class="alignnone size-medium wp-image-1296" style="float: left; margin-left: 10px; margin-right: 10px; border: 10px solid black;" alt="The bookshelf" src="http://helen.wilding.name/wp-content/uploads/2013/02/IMG_20130215_184157-300x225.jpg" width="300" height="225" /></a>We've just been having our dining room redecorated and recarpeted to make it into a better study/office and not a dining room. This means I have had to carry all the contents of our bookshelf upstairs (two weeks ago) and back down again (today). Now bearing in mind, this household has two OU MBAs - gained through slightly different elective routes - plus my MSc STiP. 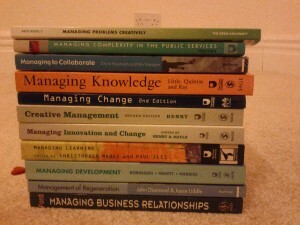 I started to realise just how many books we have with 'managing' or 'management' in the title.<span id="more-1295"></span> So there are those that just start with plain old 'managing' <blockquote>Managing learning - Managing change - Managing innovation and change - Managing business relationships - Managing development - Managing knowledge - Managing problems creatively</blockquote> Interesting that some are about managing a 'thing' - like knowledge or relationships - others are about managing a 'process' - change; learning; innovation; development. One rather cleverly uses the word 'to' to play on the 'coping' meaning of the verb manage <blockquote>Managing to collaborate</blockquote> Others use management <blockquote>Management of regeneration - Creative management</blockquote> But, the main conclusion I have reached from studying all these texts over the years is that you don't really 'manage' all these things at all in the 'control' sense - you manage 'for' them - manage in a way that create the conditions where they are more likely to emerge (to be the outcome). I wonder why book authors don't seem to portray this in their titles - how much more intriguing it would be if the word 'for' was there <blockquote>Managing for learning - Managing for change - Managing for innovation - Managing for collaboration - Managing for regeneration</blockquote> and also I start to wonder if you take the 'creating the conditions' perspective wouldn't you just manage for all these things at once, you wouldn't have to think you were doing different things at different times <blockquote>Managing for learning, change, innovation and collaboration</blockquote> isn't that about managing systemically for systemic change?